Transmedia storytelling, technology and new production models change the way we consume entertainment and engage with brands. Lost in Transmedia is a blog by Theodor Arhio, Head Of Creative Services at TBWA that digs deep in to the rapidly changing content market. The views and opinions are his own. Television, the king of "now"
TV – the shrine of modern times is not going anywhere, not for a long time. People preaching the end of television seem to be blind to the fact that the current transformation in content consumption is not about the distribution models, it´s about time. Of course some of us want to binge-watch our favorite show from Netflix whenever we want, but there is a lot of people still who gather around the modern camp fire at a certain time every week to share a story. And let´s face it, Superbowl is better live than watched as clips from YouTube the next day. TV, in all it´s glory, is a linear content distribution channel and linear TV is best for events and developing stories. Everything that happens in the "now". Linear TV dominates our hunger for fresh content and looking at the figures, sports is the king of live content on the planet. The devotion of sports fans will keep linear TV relevant for a long time to come. TV is also the most effective way to reach millions, even billions of people simultaneously. You don´t see millions of people gathering to internet at the same time to witness an event (Ok, the Stratos jump and the wedding of William and Kate excluded, but those events also gathered ten times more audiences in TV). We, as content producers depend on television to make phenomenons out of our creations. 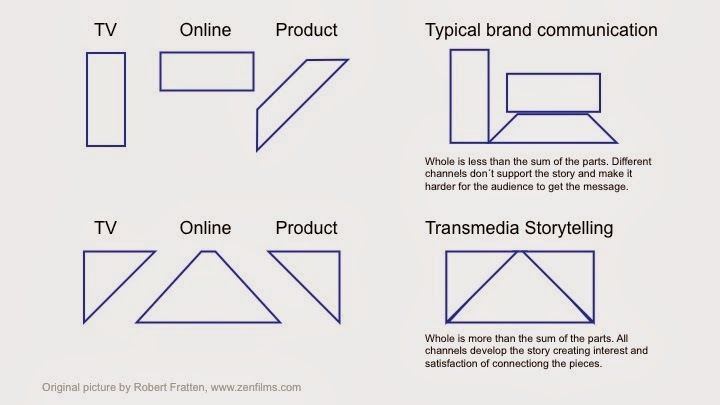 Looking at any transmedial storytelling campaing, TV is the best way to steer traffic to other touchpoints. And that goes for marketing automation as well. The results we have got from our campaigns for Fonecta, a finnish internet marketing tools provider for SME's, clearly show that without the support of television, the numbers drop through out the sales funnel. Even with a massive online campaign combined with quality content and effective automation. Although online is gathering viewers, TV is still the most powerful tool to tell compelling stories and drive traffic to other channels. For majority of companies, a brand is just a tool to sell products. A necessity to increase the value of a product line or a factory. Their eyes are on the product, which for any company is short sighted. If companies would shift their focus from products to brand, they could discover new opportunities that a strong brand can create. Take Angry Birds. A Finnish game company that set out to create positive brand experiences for their fans now has wide set of products ranging from toys to soft drinks (a cola that in some markets outsells Pepsi and Coca-Cola on a weekly level). The mobile game they started with, only brings about 30% of their revenue (depending on the media that reports). Their ToonTV now distributes content from Disney and Sony as well as stuff from Stan Lee turning them into a media house. Red Bull has also made content a thriving business, by shifting the focus from an energy drink to "the world of Red Bull". Jamie Oliver is a household name in food industry, because he is not focusing on one single product, but on the brand called Jamie Oliver and the potential it has to grow in to new business areas (knowingly or unknowingly). What all these brands have in common is that they constantly develop new ways to use the brand to engage, not just optimising single product sales. At the same time media companies have less and less capital to produce content for the ever increasing demand and this opens new possibilities for brands to create compelling stories that build awareness and drive business. In a fast moving world, who else has the knowledge and the expertise to produce specific quality content but the brands. It´s just a matter of turning sales in to positive brand experiences for the fans. In the future this is also necessity for brands. As more channels appear and the major ones try to monetize their audiences, it just get too expensive to reach the hearts of fans through plain marketing. Brands need to start producing quality content that we all enjoy and share. In social media or in real life. With the ever increasing amount of brand content being produced in the world today, the fine line between advertising and entertainment needs to be redefined. Advertising traditionally can be easily spotted and separated from entertainment, but what happens when brand starts to behave like a media? Take Chipotle, which has ventured in brand content before with heartfelt short animations, haunting soundtracks and mobile games, but now they are launching a four episode comedy series on Hulu called "Farmed and dangerous". The series carries on Chipotle´s message of natural farming and will no doubt receive millions of views in the beginning and, depending on the quality of work, millions afterwards. This brings us to the problem. In many countries, advertising and entertainment has to be clearly separated. In Chipotles case the question is: is this tv-show entertainment or is it advertising? It has all the characteristics of good entertainment. Good actors, director and production value. It also is in the format of entertainment, a TV-show. But, it will eventually advertise Chipotle and it´s products. Making it then, what? Brand content. The idea of brand content is nothing new. Red Bull has done it for some time and found new sources of income from content and let´s not forget toy industry. Would G.I.Joe and He-Man sold so well if there hadn´t been an animated series for kids for all those years. It would be fair to mention Disney here, but that seems kind of obvious, right? In all of these previously mentioned cases, the fans get what they want: good entertainment in the form of popular culture. The brands get also what they want. Their message in a form that their customers love and make them spend more. As more brands try their wings in brand content and the line between advertising and entertainment blurs, goverments should rethink their legislation. Not to thighten it, but to create clear rules so that the fans and the brands can both win. It is possible. At least, that´s what I feel watching my old G.I.Joe figures. Binge-watching or binge-viewing is a hot topic at the moment and rightfully so. After years of watching linear TV programming or catching up the episodes on VHS after the premiere, audiences and fans are embrassing the possibility to finally consume entertainment just the way they want to and for how long they want to. Like it pretty much is with every other consumer product. So, the digital revolution is finally catching up with serialized entertainment. Before we came up with the term "binge-watching", people sloutching before TV for hours on end were called "couch potatoes". I remember my mom reminding me that "too much TV will rot my brain" and I should "go out, it´s a beautiful day" in the middle of my weekend marathon of "Knight Rider", taped on VHS of course. Binge-watching on the other hand, is socially acceptable and makes the linear television look old fashioned. Finally the audience has the control. But is binge-watching something new? Yes and no. For the older generation, binge-watching is welcomed form to consume your favorite content, but if you look at the web-savvy and web-native younger generation binge-watching is nothing new. Because of the short format of online video, binge-watching is all you do and you do it several times a day. As the attention span gets shorter, it will further change the way entertainment is consumed in the future. And the change is already in motion, at least that´s what it looks like if you look at the figures. 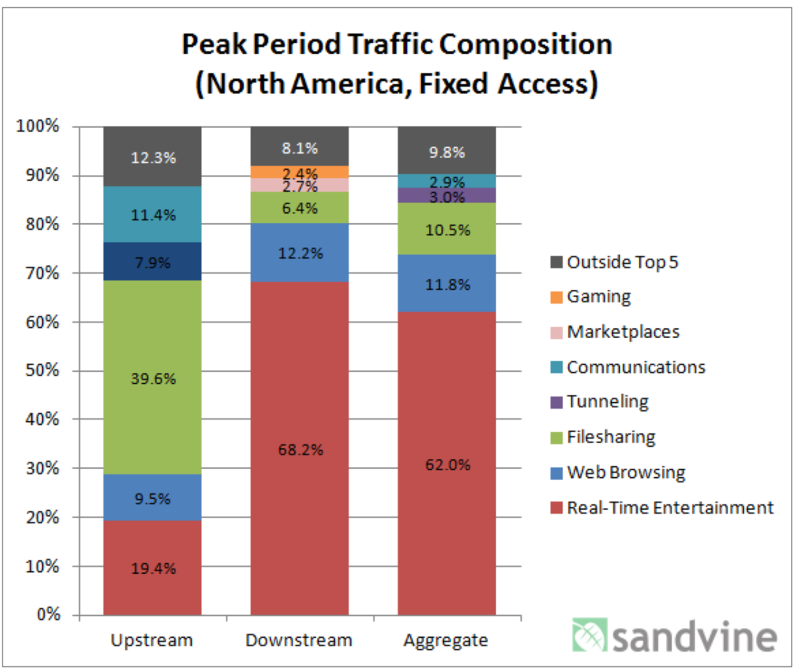 According to Sandvine, real-time video and audio entertainment traffic takes up most of the Internet's bandwidth and that means Netflix, Amazon Prime and YouTube. And the time spent with these content providers is time taken from the traditional TV Networks, who now face a challenge that can be terminal for them. Ad funded TV Networks need to figure out how to make revenue when viewers are in control and only want to watch the content, not the ads, for hours on end. And to make the situation even more challenging, brands who buy the ads are waking up to a new world where quality brand content can compete with the best entertainment for the attention of the audience. Take Chipotle´s short films "The Scarecrow" and "Back to the start". These are prime examples of brand content that captures the attention of the audience and can keep it for hours on end. And with a free channel like YouTube, why would Chipotle waste their media budget on advertisements, when investment in quality content pays off better. Now Chipotle just needs to mass produce it for the binge-watchers and they will have the attention of the masses for hours on end. Storytelling is in the heart of every culture, community, family and human being. And no matter the what changes occur in the evolution of media, stories or content, which ever name you prefer, is in the heart of human interaction. In todays higly digitalized world every touchpoint between the consumer and the brand is media and media needs content. Transmedia storytelling can be defined as a story that unfolds across multiple media outlets, touchpoints and platforms, and although it doesn’t always happen, with a degree of audience participation, interaction or collaboration. The purpose is to create a unified and engaging experience for the audience, where each medium really makes its own contribution to the development of the story. It is the best and most effective way to connect especially with the new generations of consumers and build a sustainable audience around a brand, as Red Bull has demonstrated. It is also profitable because it redefines and increases ROI, increases impact over media, and can create new sources of income. Marketing executions no longer communicate about a medium that contains the story (tv ads directing you to see the product) but can actually be a part of the whole story. This can be seen in our upcoming brand content platform "Buy This! ", that mixes fictional story with actual brands and their marketing content. The noise in media is getting even louder while media keeps saturating. In order to get their voice heard brands and entertainment IP´s need to have multiple touchpoints to the audience and this means bigger budgets in the traditional marketing models. Transmedia storytelling lowers production costs by sharing assets across media and increases effectiveness, since no part is just a vessel for a message, but a part of a bigger story. The challenge for entertainment IP´s to do transmedia storytelling is that different channels are owned or controlled by different partners that might not share the same vision or the long-term commitment. Usually this is because the main focus is given to the film or tv-series, making other channels and platforms just a way to capitalize the hype. Product and service brands on the other hand usually have a clear vision and long-term commitment, but often face the problem of not having a consistent plan on how to do transmedia storytelling across multiple mediums and platforms while driving better business at the same time. This usually is because brand content is not considered to be something that the audience is willing to pay for, making the brand content and it´s distribution a marketing investment instead of source of income. We already have greater connectivity and consumer empowerment than ever before. Never before have people had so many devices and screens from which to follow a story, and now the consumers seek new experiences and a deeper engagement. That has created an on-demand culture, where consumers can turn on and tune-in 24 hours a day, creating an unseen need for content and storytelling. Brands find new revenue streams from content and become media themselves, offering besides great products and services, great content and stories.